Hunting Island’s North Beach would receive an additional 1.2 million cubic yards of sand pumped from the ocean floor. Under the settlement reached with the Coastal Conservation League last year, the number of proposed groins — hard structures extending into the water to trap and build up sand on the beach — would be reduced from four to one with an option to build a second. 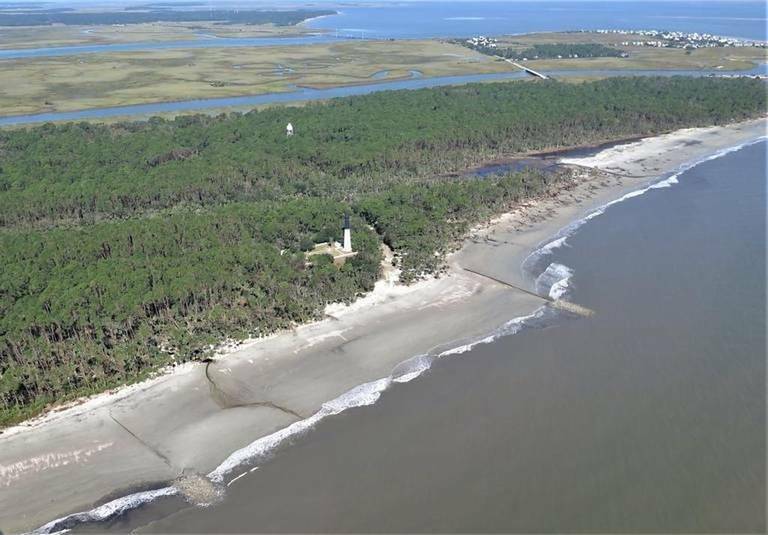 A long-planned project to restore Hunting Island’s beaches and protect the iconic lighthouse is still without a firm timetable as the state park prepares for summer crowds. State park officials say a plan to pump additional sand onto the barrier island’s beach could now happen by late summer or this fall. After negotiating an agreement with environmental groups last year to limit the scope of the work and avoid sea turtle nesting season, the state has returned to the table and asked to begin the work a couple of months before nesting season ends. The state also agreed to wait until after October to do the work to avoid active turtles. State park officials have since suggested beginning the work as early as August, visiting with the environmental group at Hunting Island. As of this week, the agreement reached last year still stands, said Kate Schaefer, South Coast Office director for the Conservation League. “We still have the same concerns we had about renourishing during turtle nesting season but appreciate their forthcoming nature and wanting to dialogue it,” Schaefer said. Hunting Island’s most recent beach restoration project was in 2006. Supporters began advocating for another beach renourishment in 2016. At the time, the proposed work was for 635,000 cubic yards of sand and two groins. After Hurricane Matthew devastated the island that fall, wiping out dunes and further eroding the beach, the scope of the proposed work doubled. The amount of sand would be the most since 1.4 million cubic yards was added to the beach in 1980. The proposal has faced opposition from environmental groups and homeowners on neighboring Harbor and Fripp islands. A group of Harbor Island oceanfront property owners contested the state permit for the work in S.C. Administrative Law Court, saying state environmental and park agencies had not monitored and fixed erosion damage they say was caused by previous renourishment projects. The asked the state to address current damage to the Harbor Island beach, for independent monitoring of the next renourishment and to limit the scope of the project. The court recently said the project could continue to the U.S. Army Corps of Engineers for review, said Mark Harbaugh, a member of the group contesting the permit. A final hearing in the case scheduled for April 25 has been canceled and a judge’s order is pending, Administrative Law Court clerk Jana Shealy said Thursday.